Very popular from the late 18th to the early 19th century, the pelisse was a coat dress, or overdress, that was worn over a dress. 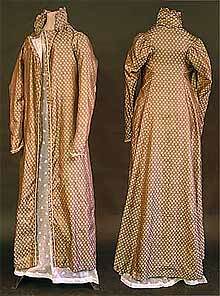 Depending on the materials with which it was made, and the season, it could have been worn in and outside the house. The one shown above, “of good quality silk in a twill weave, woven with a small repeat pattern of oak leaves in a golden straw colour on a warm brown ground”, is said to have been worn by Jane Austen. It is described thus: “The pelisse has long sleeves gathered at the head but close fitting below the elbow, a high standing collar, and is open at centre front with no fastenings. The front is edged on both sides with bright yellow cord which also appears at the wrists. The gown over which it would have been worn would have shown several inches below the pelisse hem, as well as at centre front and at the cuffs. It is lined throughout with white silk and is, of course, entirely hand made.” The shape and the size of the sleeves suggest that it was made between 1813 and 1815. Another reason that points to that period, during which England was at war with France, is the oak leaf motive, which symbolized both the strength of the Navy and of the nation. But how is it supposed to be connected to Jane? Although there is no definite proof the pelisse was worn by Jane, it belonged to her family. The coat was presumably given by Cassandra to her brother Edward. His daughter Marianne gave it to a family friend, Miss Eleanor Glubbe, later Mrs Steele. Years later, she returned the pelisse to Mrs Winifred Jenkyns, a great granddaughter of James Austen, Jane’s eldest brother, with a note that reads “I missed the little coat for a long time but lately it turned up. I cannot remember if it was ‘Jane’s’ but it seems probable”. To find out more about this pelisse, click here.